SimVessel is an interactive computer program demonstrating the physiological behaviour of smooth muscle strips from the antrum gastricum and the aorta of the rat. 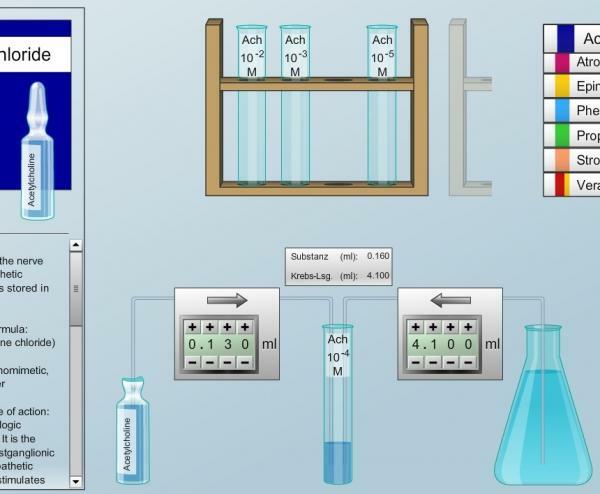 It includes 3 sections: Preparation - 7 audiovisual sequences showing the preparation of the vessels; Chemical Lab, featuring the preparation of experimental solutions from among a range of chemical and pharmacological substances (acetylcholine [ACh], atropine, norepinephrine [NE], phentolamine, propanolol, verapamil); Practical Course - the interactive part of the program, which allows the student to perform numerous experiments in the virtual laboratory, using a transducer, an amplifier, a chart recorder, and a large storage glass tube. There is a facility to accelerate the experiment by a time factor of 2 or 4. Ingenious mathematical algorithms freshly compute the behaviour of the specimen according according to the current parameter settings, while the specimen itself displays a realistic behaviour: after program start, an individual and unique profile of properties whithin the physiological range is calculated for each specimen. The experiments featured are: myogenic automaticity; tonic and phasic contraction forms; competitive inhibition; functional antagonism of ACh and NE; calcium channel blockers. In addition, SimVessel includes a high-performance analysis module to save, comment and print experimental results.